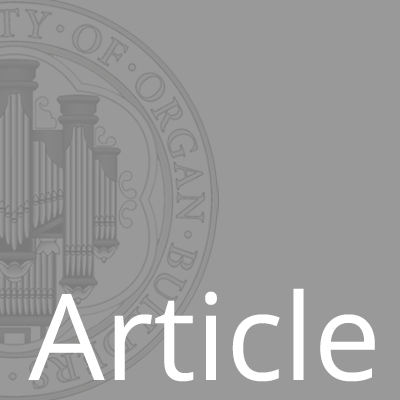 I have always wondered why organ builders and organ tuners disagree so much about tuning temperaments. Those whose main work is with cathedral organs tend to regard any tuning other than Equal Temperament with disdain, Others, whose main work lies with chamber organs and instruments in less reverberant churches, both here and in America, regard the use of an unequal temperament as almost an article of faith. As every tuner knows, twelve pure fifths appear to make up seven octaves but the sequence will actually end up slightly sharp to the unison. Similarly three major thirds appear to make up one octave but, in reality, are somewhat narrower. The situation with four minor thirds is even worse. Actually, however, it is the major thirds that matter. For a start, Sesquialteras, Cornets and Tierces have one rank sounding a major third up from the unison. So, play a chord incorporating a major third with, say, 8 ft, 4ft, 2ft and 1.3/5 ft stops drawn and the upper note (E in the key of C) of the 2 ft pipe will be sounding the same note as the lower note of the 1.3/5 ft stop. Or will it ? The 1.3/5 ft stop will be tuned a true third from the unison but, in Equal Temperament, the E pipe of the 2 ft will be sounding a tempered third from the C – one seventh of a semitone sharp. And if there is one thing our ears do not like it is two theoretically identical pipes sounding different notes, we find the resulting rapid beats offensive. This problem has been known for centuries. The ‘mean tone’ tuning system was first devised back in the 16th century. This gave perfectly pure thirds in the scales of Eb, Bb, F, C, G, D, A & E. But woe betide anyone who ventured further afield ! The other four keys were unusable, with thirds nearly half a semitone out. This was replaced in the eighteenth century by ‘sixth comma’ tuning – sometimes known as the Silbermann temperament – the major thirds were tempered in eight popular keys – but by less than half the error found in Equal Temperament. This improved matters but still left four keys (B, F#, Db& Ab) with ‘gritty’ thirds one third of a semitone sharp. Many efforts were made to close the gap; attempting to make remoter keys usable but, in recompense, diluting the purity of the thirds in the popular keys. The end of this road is Equal Temperament in which the inequalities are spread evenly over all key signatures. “I will own I do not like it … I never enjoy playing on an organ where nothing is in tune, where simple triads produce the effect on the ear which dissolving views do to the eye before a picture has reached its full focus.”. More recently, the Baroque revival stimulated interest in old temperaments. Some enthusiasts claimed that particular temperaments solved all the problems. This is, however a mathematical impossibility – one can only rob Peter in order to pay Paul. It is a matter of judgement what extent one favours the keys with few sharps and flats at the expense of the less popular remote keys. One quite popular unequal temperament was developed in 1800 by Thomas Young, the all-round genius who so nearly deciphered the Rosetta Stone. Young’s tuning makes the thirds milder in the four remote keys, but at the expense of the sound in the keys of A, E, Bb & F (but still better than or equal to Equal Temperament) Another popular tuning is due to Francesco Valotti (1697-1780). This is identical to Young’s except in that it favours the keys with flats in the key signature, whereas Young’s tends to favour keys with sharps in the key signature. Coming back to our original question, why do organ builders disagree so strongly about the merits of Equal and Unequal temperaments ? I believe that it all comes down to acoustic experience. Many voicers will know that the absorption of sound by the air itself has the effect of taking a hard edge off the extreme treble of organs in reverberant buildings and that, conversely, its absence can make an instrument sound aggressive in a dryer and more intimate acoustic environment. My experience is that the ‘Angry Thirds’ in Equal Temperament give life to an instrument in a reverberant building, avoiding the risk that it might sound rather bland. One example is the Kenneth Tickell instrument in Worcester Cathedral, tuned in Equal Temperament. On the other hand, the William Drake organ in the intimate environment of the crypt chapel of the Houses of Parliament (Palace of Westminster) is tuned in Thomas Young’s temperament. Equal Temperament’s ‘Angry Thirds’ (as used in the previous GD&B organ in the same venue) were quite unpleasant here. I believe that this is the reason for the difference of opinion amongst organ builders and organ tuners. Those whose main work lies in large reverberant cathedrals naturally prefer Equal Temperament but those who are accustomed to building organs for less reverberant buildings will frequently have nothing to do with it. How can these differences of opinion be resolved ? It is Fortunate that technical developments have come to our aid. We were formerly limited to temperaments that can readily be tuned by ear, without mechanical aid. The advent of electronic tuners has changed all this and allowed the development of ‘intermediate’ tunings. Simon Brown of Kenneth Tickell developed his own tuning for the new St Mary-le-Bow organ in Cheapside, London, when it was found that, in the quite reverberant conditions of that church, Vallotti tuning was perhaps too unequal. Simon tempered the remote keys a little further than Valotti or Young but at the expense of D and A major. The new Richards, Fowkes, organ in the fairly dry acoustic of St George’s, Hanover Square, London, is tuned in Niedhardt (slightly milder than Young’s tuning). The fact that both tunings have proved successful in churches with ‘intermediate’ acoustics proves my point and indicates a way forward to using an appropriate tuning for each building – ET for those reverberant ones and unequal tunings for a drier acoustic, with a continuous range in between. In this way we can manage the ‘Angry Thirds’ to our musical advantage. © 2019 The Incorporated Society of Organ Builders. All Rights Reserved.